On the evening of Good Friday- April 14, 1865, as President Abraham Lincoln and his wife Mary Todd enjoyed Our American Cousin at the Ford’s Theatre, famous stage actor and Confederate sympathizer John Wilkes Booth approached the President from behind and shot him in the back of the head. With the President slumped in his chair and chaos ensuing, Booth made the twelve foot jump to the stage, injuring himself in the process, and screamed “Sic semper tyrannis” — “Thus always to tyrants.” Pushing his way through the crowd, he jumped on his horse and escaped off into the night. But that wasn’t the only violent assassination attempt on a government official that night. John Wilkes Booth and his fellow conspirators had a much greater plan in place. One that, if it had been properly executed, could have thrown the newly re-united country into anarchy. In November 1864, a Confederate victory was slipping away, the Emancipation Proclamation (issued 18 months prior) was eroding the South’s power, and Abraham Lincoln was overwhelmingly re-elected as President of the United States. An enraged John Wilkes Booth rounded up others with the same political alliances (mainly, southern and anti-abolitionist) as him to conspire on how to put a stop to all of this. Meeting regularly at Ms. Mary Surratt’s boarding house in Washington, Booth’s motley crew, among others, included a young, handsome Confederate soldier by the name of Lewis Powell and an alcoholic “notorious coward” named George Atzerodt. Lewis Powell was born in Alabama, but moved all across the Southern states as a child due to his father being a traveling Baptist minister. At 17, he joined the Confederate Army. He was wounded and captured by Union forces at the Battle of Gettysburg in 1863. While in a Baltimore Union hospital, he romantically befriended a young volunteer Union nurse by the name of Margaret Branson, who helped him escape. He made his way South, to behind enemy lines in Virginia. He moved back to Baltimore, under the alias “Payne,” where he met up back again with Branson. Later, he was arrested for violently beating a black maid, only to be let off due to lack of witnesses. Eventually, he aligned with the Confederate operative David Parr, who introduced him to John Surratt (Mary’s son) who introduced him to Booth. George Atzerodt was completely different than Powell. Born in Germany, he immigrated to America with his family in 1843 at the age of eight. He opened a carriage repair business in Port Tobacco, Maryland. His business would fail and he would spend his days drinking and feeling sorry for himself. Later, during Atzerdot’s trial, a fellow Port Tobacco resident who had been called as a witness described Atzerodt as a “notorious coward” and was known around town as someone people could not rely on. Whether this was true or not, during the Civil War, he assisted Confederacy agents and met John Surrett and, then, John Wilkes Booth. They allowed him to stay at Mary Surrett’s boarding house, though he would be kicked out later for drinking alcohol in the house. Booth, with Powell, Atzerodt, Surrett, and several others by his side, came up with his first plan to stop the “Northern intrusion.” Booth and his co-conspirators would kidnap the President, Abraham Lincoln, and use him as exchange for Confederate prisoners of war. According to Booth’s inside information, the President was to attend the play As the Waters Run Deep at Campbell Military Hospital near Washington on March 17, 1865. On that day, Booth and his men assembled on the outskirts of town in various strategic positions to intercept the President’s carriage… but he never showed. Booth would later find out that at the last minute, the President had changed his plans. Instead of attending the play, he attended a ceremony in which he presented the 142nd Indiana Infantry with a captured Confederate flag. Had Lincoln not changed his plans that day, American history may have been quite different. Upon this failure, Booth and his conspirators developed a new and more bold plan; they would assassinate the President and several of his highest-ranking officials. Booth himself would take the President, but he needed his co-conspirators to go after the other government officials. Powell wanted violent chaos, Atzerodt wanted a new reputation. Both of these men volunteered to be Booth’s most important co-conspirators. Booth gave Powell the task of murdering the Secretary of State, William Seward, at his home in Auburn, New York. Seward was an easy target as he was more or less bedridden having recently been badly injured in a carriage accident. Booth assigned Atzerdot the task of assassinating Vice-President Andrew Johnson. The same night Booth shot Lincoln, Powell arrived at the Seward household at approximately 10 pm. Two hours earlier, Booth had met with Powell to give him a gun, a knife, and his getaway horse. Calming knocking on the door, Powell waited for someone to answer. William Bell, a servant, opened the door at which point Powell explained he had medicine for the Secretary of State that required urgent delivery. Bell refused Powell entrance, at which point Powell pushed his way past Bell only to be confronted by Frederick Seward, William Seward’s son. Frederick told Powell he would take the medicine. Not to be dissuaded, Powell clubbed Frederick in the head with his gun (he would be in coma for 60 days after, but would eventually recover). 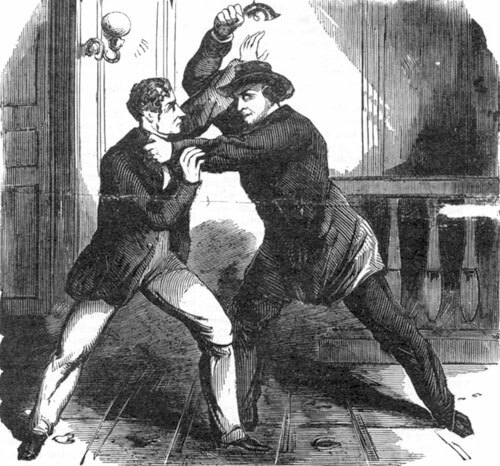 On his mad dash to William Seward’s room, he slashed George Robinson, a bodyguard, in the face and screamed “I’m mad, I’m mad!” He made it to Seward and was able to stab and slash at the neck and face of the Secretary of State several times before being thrown off. Powell then fled, attacking those he encountered on his way out of the house and made it to his getaway horse, where he was able to escape — that is until two days later, on April 17th, when he was arrested. Despite the wounds to five people in Powell’s rampage, they all survived, including Seward. On the morning of April 14th, George Atzerdot checked into the Kirkwood Hotel under his own name. Vice-President Andrew Johnson was also to be in the Kirkwood Hotel that evening. Atzerdot spent all day thinking, considering, and working up the courage for the task at hand. 10 pm rolled around and Atzerdot decided a little liquid courage might be helpful. Thus, he went to the bar rather than going to find Andrew Johnson. For the next several hours, he drank himself silly and then wandered the streets of Washington aimlessly, mumbling to himself. He never attempted to take the life of Andrew Johnson. However, at one point, he did ask a bartender about the whereabouts of the vice-president. This led to his arrest a day later when that bartender called the authorities saying “a suspicious-looking man in a gray coat” had seemed to be up to no good and had inquired about the vice-president. On July 7, 1865, Lewis Powell, George Atzerdot, Mary Surratt, and David Herold were hung at Fort McNair in Washington DC as co-conspirators in a plot to assassinate high-ranking government officials. John Wilkes Booth did not join them on the gallows. He had been tracked as a fugitive and shot to death on April 26, 1865. Today, you can still visit Ford’s Theatre, the site of Lincoln’s assassination, and the Seward House in Auburn, New York, where you can walk up the very same stairs Lewis Powell used in his failed attempt on William Seward’s life. Not much is known about David Herold, the other co-conspirator who hung on the gallows with Surratt, Powell, and Atzerodt. He was born to wealthy parents and attended classes at the Charlotte Hall Military Academy in the late 1850s, where he apparently met John Surratt, Mary’s son. He was the one who led Powell to Seward’s house. He was also found with Booth when authorities finally caught up to them.